I've published more than 100 fitness articles and became the Bodybuilding.com 2012 Male Writer of the Year. My goal is to help you get in the best shape possible! my name is Craig. I&apos;m 6-foot-4, and almost every muscle group in my body is tight. Consequently, my cardio has suffered because I&apos;ve been struggling with shin splints and other running- and football-related injuries. Can you help me out? Hey Craig, I&apos;ll do my best to help you out. Shin splints and other leg injuries like strains are common among fitness enthusiasts and former athletes. You may have learned how to deal with these injuries, but who wants to be sidelined when you could be training? Prevention is the best medicine. One of the best ways to prevent injuries, aches, and pains is to do a proper warm up and stretching routine before you do any form of cardio. Even if you&apos;re just walking, it&apos;s a good idea to make sure your muscles are properly prepared for the work ahead. I suggest 3-5 minutes of slow jogging before stretching. Your muscles should be warm before you try stretching them. If they&apos;re cold, you won&apos;t get a full and proper stretch. Before you run, walk, climb stairs, or perform sprints, you should do these 5 stretches. They&apos;ll help prepare your hamstrings, calves, shins, and groin for training and minimize your chance of injury. To stretch your hamstrings, stand with your legs shoulder-width apart and reach down as far as you can. Grab your ankles, toes, or even touch the ground, if you can. Hold the stretch for about 15 seconds and make sure you don&apos;t bounce. Do 3 or 4 repetitions. This is a great hamstring and glute stretch. To do it, lie on your back with your legs extended and feet close together. Bring your right knee to your chest and pull it into your body with both hands. Hold for 15 seconds and switch legs. Stretch each leg 3 or 4 times. Don&apos;t ignore your groin. A great way to stretch it is to sit on the ground with your knees out and the soles of your feet together. Sit upright and place your hands on the top of your feet. Engage your core and slowly bend forward with your hips. For a bigger stretch, place your hands or elbows on your knees and push them downward. Hold this position for about 15 seconds and try to avoid rounding your back. Do this for 3 to 4 repetitions. An Achilles tendon tear is all too common for people over 35. That&apos;s why it&apos;s important that you take the time to stretch that area before you run or play a sport. To do this stretch, place one foot slightly behind the other. Keeping your heels on the floor, bend both legs until you feel a stretch in the lower part of your back leg. Hold the stretch for 15 to 20 seconds and switch legs. Do 3 or 4 repetitions on each leg. Shin splints are annoying and painful. 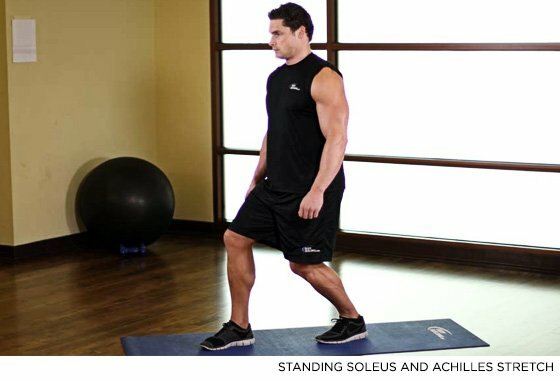 Stretching the anterior tibialis (shin muscle) goes a long way toward avoiding this scourge. Sit on a chair or couch and extend one leg. Point your toes forward and down as far as they can go. Hold for a 15-20 seconds. Slowly bring your toes up toward your body and hold for another 15 or 20 seconds. Alternate legs. Stretch each leg for 3 or 4 reps.